Today European Commission announced the launch of an investigation to determine whether Samsung has violated EU antitrust laws in its legal agreements with competing companies. The European Commission will focus on patents that must be licensed on FRAND (fair, reasonable, and non-discriminatory) terms. According to two people with knowledge of the inner workings of a coming iteration of the Apple iPhone - although not necessarily the next one - a chip made by Qualcomm for the phone's processor will also include near-field communication technology, known as N.F.C. 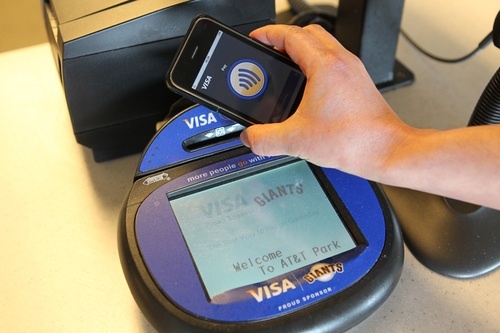 This technology enables short-range wireless communications between the phone and an N.F.C reader, and can be used to make mobile payments. It is unclear which version of an iPhone this technology would be built into. At Macworld Autodesk showed off its new program Autodesk Inventor Fusion for the Mac. Autodesk Inventor Fusion is an existing 3D modeling software on Windows, and soon it will become available for the first time on the Mac. Analyst Ben A. Reitzes with Barclays Capital said in a note to investors on Wednesday that Apple's growth in China now extends beyond the iPhone and iPad, with Mac sales there also continuing to outpace the U.S. Reitzes believes that Apple's total global sales will be up 22 percent year over year, thanks largely to rapid expansion in China. "We believe Mac sales remain relatively strong even as the economy weakens, benefitting from new stores in China and strong sales of the MacBook Air," he said. "Even though the economy and HDD shortages are concerns that could limit upside, we remain comfortable with our estimate for 22% (year over year) Mac unit growth for (the fourth quarter of calendar 2011) given overseas momentum -- especially in China where growth is much higher." It looks like iPad 2 and iPhone 4S untethered jailbreak will truly be a team effort. Recently another hacker Saurik joined the team and made "some major contributions" yesterday. Last week Pod2g announced that Planetbeing, MuscleNerd, and P0sixninja joined his effort to release an untethered iOS 5.0.1 jailbreak of the iPhone 4S and iPad 2 (A5 CPU devices). “What’s good for developers is good for customers”. Forrester Research issued its Global Tech Market Outlook for 2012 and 2013 on Friday where the research company argued that Apple will “reshape the computing equipment market.” The study cited the adoption of iPad and Macs among professionals as proof that Apple is “dramatically disrupting” the corporate market traditionally dominated by Microsoft, Dell, Lenovo, and HP. Analysts have been predicting that cloud computing — specifically, infrastructure-as a service (IaaS) — will reshape the server and storage market… Actual adoption of IaaS remains limited…The biggest disruptive force in the computer equipment market thus is not IaaS, but Apple. This is a surprise, because Apple has not and does not directly address the corporate market, while turning a wide variety of consumer technology markets upside-down. 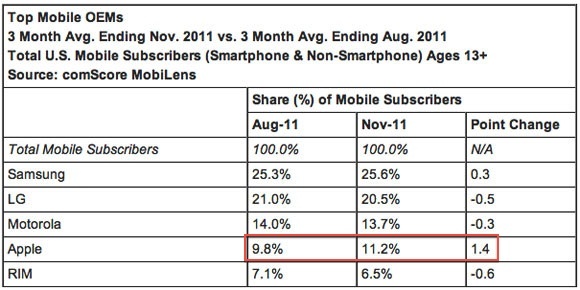 But its rapid growth in the corporate market has been the big surprise of 2011, and it will be even more of a factor in 2012. 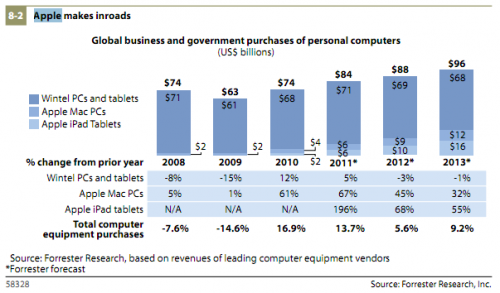 According to the survey, the business sector will buy $10 billion worth of iPads this year, up from $6 billion in 2011. IT departments are also projected to spend $9 billion on Macs in 2012, up from $6 billion in 2011. Mac and iPad spending will rise to $12 billion and $16 billion, respectively in 2013, according to the survey. 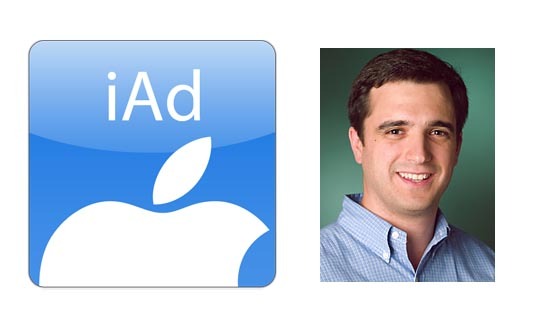 Bloomberg reports that Adobe executive Todd Teresi was hired by Apple to head up its mobile advertising unit iAd. Detailed information on the employment will be forthcoming. Teresi has worked as VP of Media Solutions division in Adobe for the past nine months and previously worked in Yahoo, PriceWaterhouseCoopers and Quantcast. 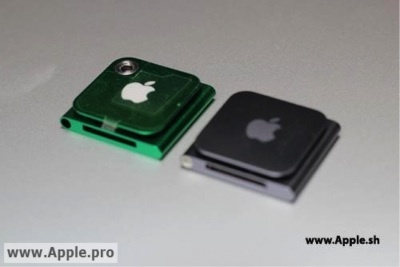 There have been many rumours about the iPad 3 which is expected to debut sometime in the beginning of 2012. DigiTimes is one of the main sources for these reports and now it claims that Apple is going to launch its next iPad at the Macworld|iWorld conference that will open on January 26th 2012. The Argentinean government has temporarily blocked sales of certain electronics including Apple's iPhone and RIM's BlackBerry. Such measures were attempted in order to stabilize the country's ailing economy, to slow rising inflation and correct the disparity between the pesos and U.S. dollar, while suggesting that companies must build plants in the country to resume sales. In order to continue smartphone sales in Argentina, Apple must build a plant or partner with a local company to manufacture the iPhone. RIM is reportedly looking to partner with an existing plant so that it can continue sales in the region. Other handset makers like Motorola, Nokia and Samsung have already moved or built plants in Argentina's Tierra del Fuego free zone after the government passed the Internal Revenue Law of 2009, which added a 20.48 percent tax to the existing 21 percent VAT for certain imported electronic devices. According to Argentinean site Fortunaweb, iPhone and BlackBerry sales comprised 60 percent of the total market in October. And to strengthen the Argentinean economy, the government made decision to support local manufactures, banning some electronics manufactures from sales in this country. The Economist reported in December article that "a slowing year-to-year GDP blamed on decreased demand for agricultural commodities and huge government subsidies have caused the country to enact tighter controls on capital flight". Analyst Brian Blair with Wedge Partners said in a note to investors this week that though Apple is believed to have built prototypes for a 7-inch iPad, and rumors of such a device launching persist, he doesn't believe Apple will release a 7-inch tablet in 2012. "Jobs was emphatic in his view that 7-inch tablets were dead on arrival," Blair wrote, "and we believe it would be unlikely to see the company test the waters in this category anytime soon." Blair thinks it's more likely that after the launch of a third-generation iPad Apple will keep its current iPad 2 on the production to decrease its price and address demand at the mid-tier range. "We believe iPad 2's price drop could drop to the $349 to $399 range with Apple offering a single 16GB model," he said.